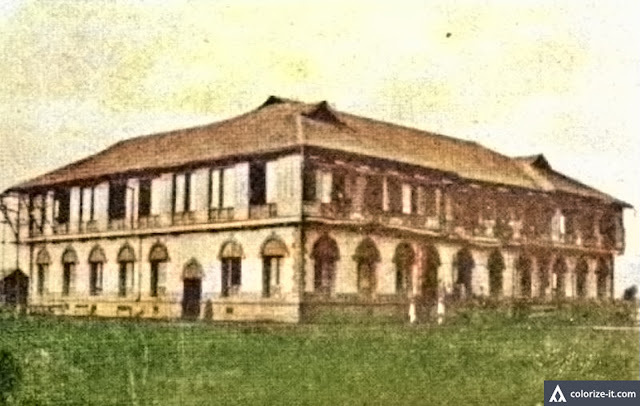 A school building in Batangas town early during the American colonial era. Image from the public domain publication "A Tribute of Love to the Memory of Anna \Elizabeth Hahn." 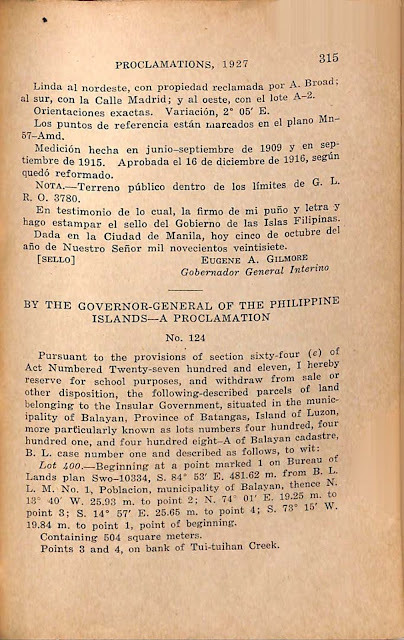 A proclamation signed by the Acting Governor-General of the Philippines Eugene A. Gilmore in 1927 reserved land and withdrew it from sale or disposition so it could be used to build school facilities. The proclamation was numbered 124. Lot 400. — Beginning at a point marked 1 on Bureau of Lands plan Swo-10334, S. 84° 53' E. 481.62 m. from B. L. L. M. No. 1, Poblacion, municipality of Balayan, thence N. 13° 40' W. 25.93 m. to point 2; N. 74° 01' E. 19.25 m. to point 3; S. 14° 57' E. 25.65 m. to point 4; b. S. 73° 15' W. 19.84 m. to point 1, point of beginning. Points 3 and 4, on bank of Tui-tuiban Creek. Bounded on the north, by lot No. 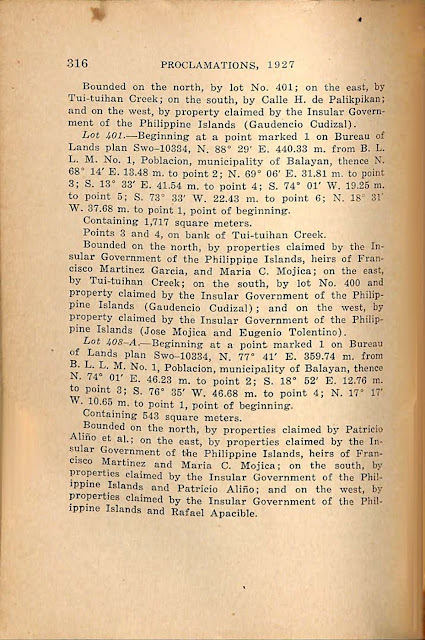 401; on the east, by Tui-tuihan Creek; on the south, by Calle H. de Palikpikan; and on the west, by property claimed by the Insular Government of the Philippine Islands (Gaudencio Cudizal). 3; S. 13° 33' E. 41.54 m. to point 4; S. 74° 01' W. 19.25 m. to point 5; S. 73° 33' W. 22.43 m. to point 6; N. 18° 31' W. 37.68 m. to point 1, point of beginning. Points 3 and 4, on bank of Tui-tuihan Creek. 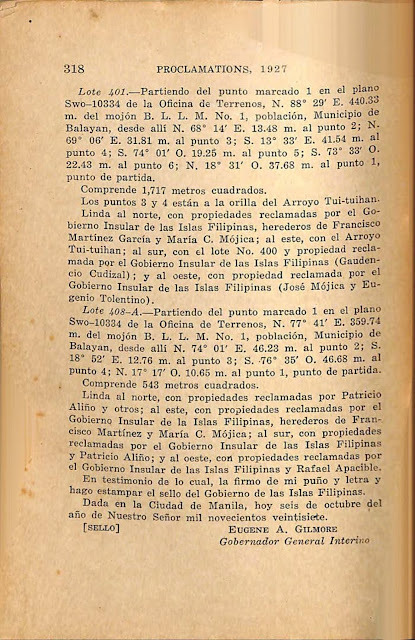 Bounded on the north, by properties claimed by the Insular Government of the Philippine Islands, heirs of Francisco Martinez Garcia, and Maria C. Mojica; on the east, by Tui-tuihan Creek; on the south, by lot No. 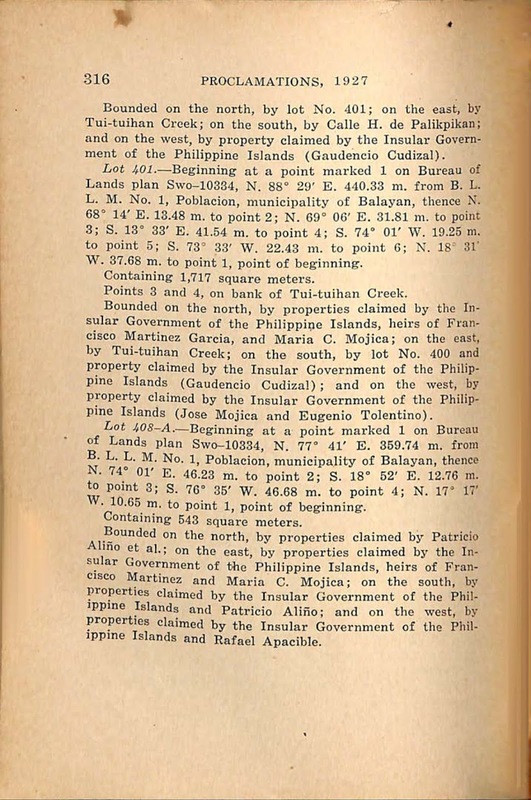 400 and property claimed by the Insular Government of the Philippine Islands (Gaudencio Cudizal) ; and on the west, by property claimed by the Insular Government of the Philippine Islands (Jose Mojica and Eugenio Tolentino). Lot 408-A. — Beginning at a point marked 1 on Bureau of Lands plan Swo-10334, N. 77° 41' E. 359.74 m. from B. L. L. M. No. 1, Poblacion, municipality of Balayan, thence N. 74° 01' E. 46.23 m. to point 2; S. 18° 52' E. 12.76 m. to point 3; S. 76° 36' W. 46.68 m. to point 4; N. 17° 17' W. 10.65 m. to point 1, point of beginning. Bounded on the north, by properties claimed by Patricio Aliño et al. ; on the east, by properties claimed by the Insular Government of the Philippine Islands, heirs of Francisco Martinez and Maria C. Mojica; on the south, by properties claimed by the Insular Government of the Philippine Islands and Patricio Aliño; and on the west, by properties claimed by the Insular Government of the Philippine Islands and Rafael Apacible. 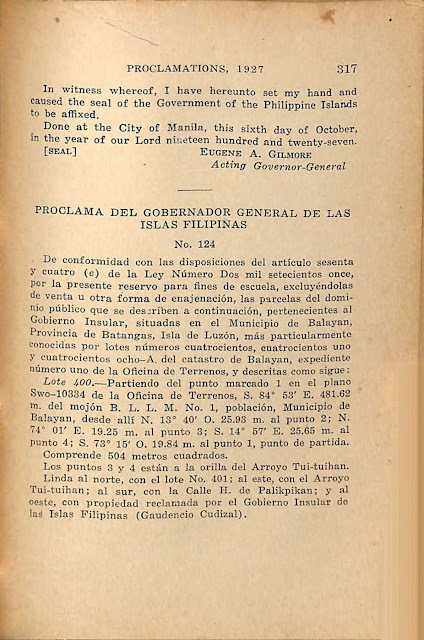 In witness whereof, I have hereunto set my hand and caused the seal of the Government of the Philippine Islands to be affixed. 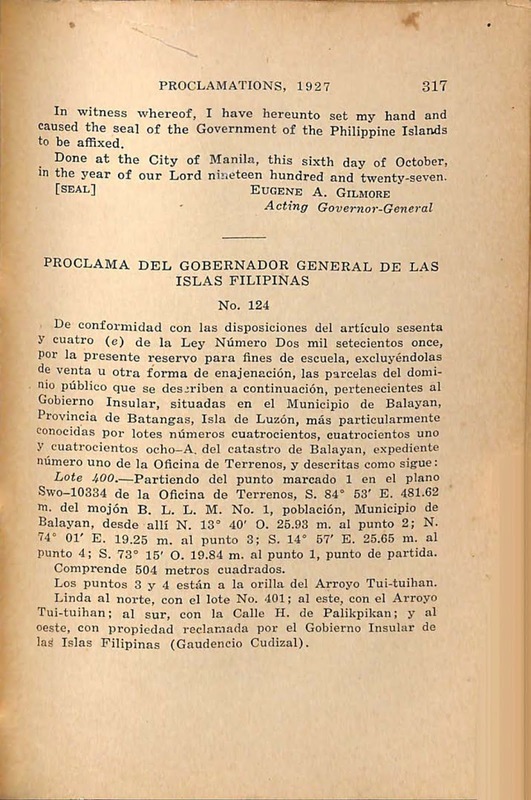 Done at the City of Manila, this sixth day of October, in the year of our Lord nineteen hundred and twenty-seven. Proclamation No. 124 s. of 1927, English version. Proclamation No. 124 s. of 1927, English version continued. Proclamation No. 124 s. of 1927, Spanish version. Proclamation No. 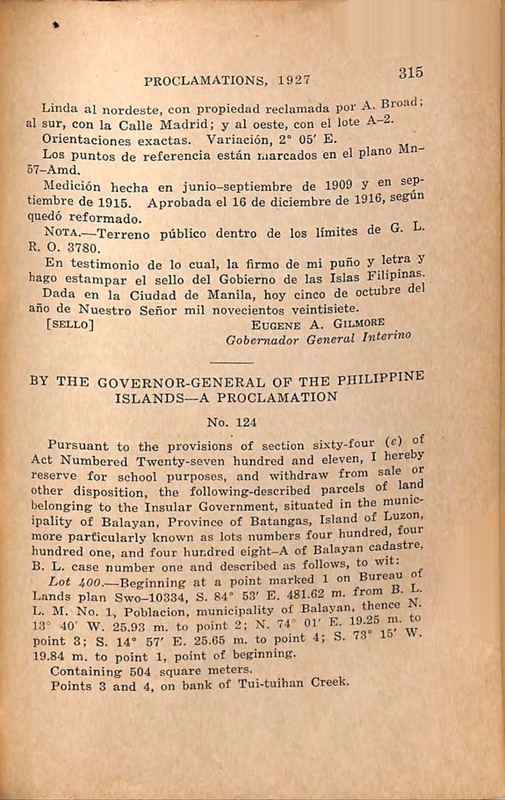 124 s. of 1927, Spanish version continued. Proclamation Nos. 62-140 (1927),” online at the Internet Archive.